This week I am pleased to introduce and share the work of Michelle Wilkie. Michelle is a self taught textile artist, and modern quilt designer living in North Carolina with her husband and son. Michelle’s education in the STEM field has helped shaped her aesthetic of precise minimalism and her bright bold and playful improv style. Her quilts are award winning and have been exhibited nationwide. I was excited to learn that she has authored a book about the process of quilt design and look forward to its release next year. Improvisation allows me to catch my breath, destress and relax. I love the freedom and the less planned nature of improv, where I am not worried about the details like measurements, accuracy, color combinations, or how I am going to write a pattern. I tend to be more of a planner and type A perfectionist, so no improvisation was not my first go to. I think I started with paper-piecing and other more planned (quilting) styles. When I did try improvisation though, I loved it. It soon became one of my favorite techniques. This really depends on what I am actually creating. Many of my quilts are original designs. When I have an idea in my head, and I know to accomplish that idea I will need to use improvisation, it is much more intentional. There are times though, I will sit down with my scraps and just start sewing to see where it will go. I usually feel the need to do the latter, when I am seeking a balance in my life. 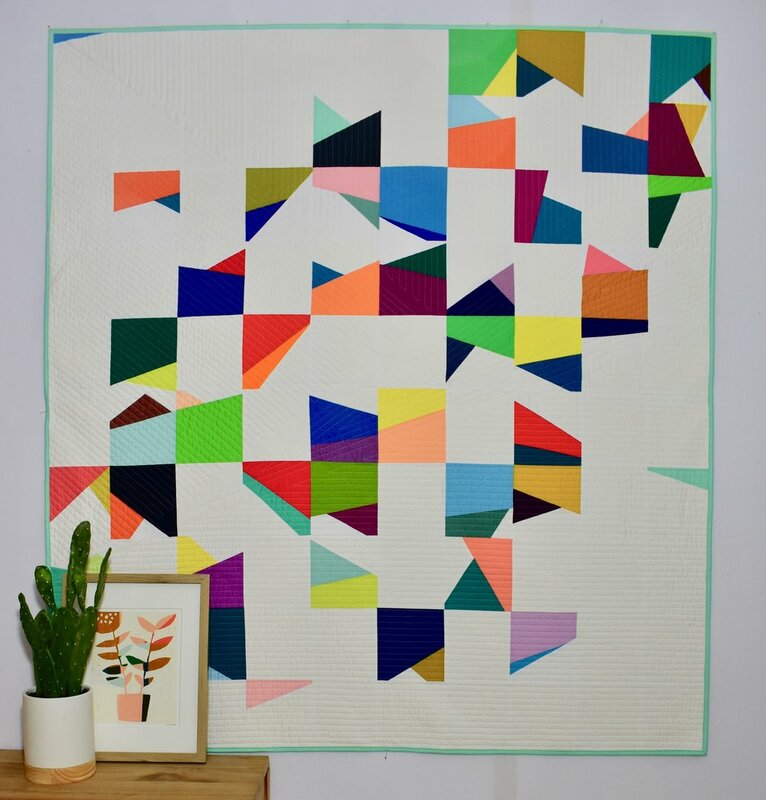 I am split between improvisational quilts and minimal geometric quilts. I think I use both techniques pretty evenly. I love the results of both but for very different reasons. You say you love both the techniques of improv and minimal geometry, I'm wondering if you would elaborate? I see shapes and design in everything and I love interpreting those images into minimal geometric designs. Taking something and simplifying it but not losing its impact, meaning or interaction with the rest of its surroundings is not as easy as it looks. I find this design process challenging and thought provoking. Many of my minimal quilts designed with meaning and tell a story or experience. On the other hand improvisational quilts, I can just go with the flow. For improvisational quilts, I review and edit, check for balance and color placement regularly throughout the making process, but its much more of a creative feel than planned. I love including a lot more color and a splash of unexpected in these pieces. I use improvisation to get unstuck and destress from work and other deadlines etc. To help get started, I might impose limits such as technique for piecing (machine stitched or hand pieced), limited color palette, limit shapes or limit time spent making per week. Inspiration is truly everywhere, but I use different sources/drive for minimalism and improvisation. For my improvisational pieces, they originate mostly from feelings that I am tapping into. For instance, “Home” was influenced when feeling homesick for New Zealand. Sunday Best was a 10 week exercise exploring my feelings around my mother’s terminal illness. Two things, think of it as an experiment and two, work out what your limits are and start there. Improvisation means removing some stringent ideas on how to quilt, like needing a ruler to cut fabric for the straight line, use of precision, controlling the colors and placement you use. Choose one or two things to change to start if you are nervous. For instance, don’t use a ruler to cut fabrics and stitch together the rough edges. You can still use a ruler to square up your blocks. What if I had more time in my day? What could I accomplish? With Instagram sometimes, it’s great to be part of a community, other times it reminds me of how much I want to do. I would love to be quilting all day, every day; alas it is really a weekend experience. So, I have learned to savor the experience when I can. I have started getting more interested in artists in other mediums. My favorite discovery is Carmen Herrera. I am inspired by the documentary of her, The 100 years show, on Netflix. She is a great minimalist artist who was discovered in her late 80’s. She is now 103 and painting every day. Just shows you what can happen if you never give up and do what you love. Thank you Michelle, for sharing your work, and your thoughts on and process of improvisation and quiltmaking with us. I look forward to being inspired to experiment and explore by your upcoming book release. And I am with you on wishing there were more hours in the day to make, create and quilt. Also, I share your love of artist Carmen Herrera, whose artwork, life, and dedication has inspired and motivated me many times. WWCD? (what would Carmen do? ), she would keep working that’s for sure! The learn more about Michelle, visit her website and check her out on Instagram @ml_wilkie.